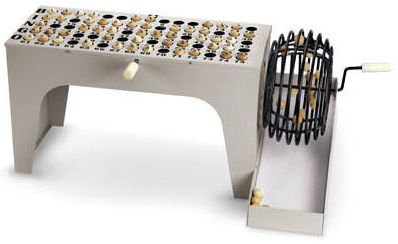 Our Speed-o-matic Bingo Cage Set includes the master board and cage unit plus 75 7/8" bingo balls. To use this bingo cage, simply put the bingo balls on the master board during the game. When the game is over, just pull the lever and all the balls drop down and roll back into the cage. Constructed of heavy gauge steel built to last!!! Measures 26 wide x 16 deep x 12 inches high.